Katrina the Tester: How do you create a friendly conference? How do you create a friendly conference? One of the things that really impressed me about TestBash a few weeks ago was the warm and friendly tone of the event. I haven't been alone in my remarks on the environment created by Rosie Sherry, Vernon Richards and others. As a conference organiser, I've been thinking a lot about what made each attendee feel this way. What were the specific actions that made such a noticeable difference when compared to other events. Here are five things that I've identified, which I'm hoping to try at the next event that I run. Rosie sent an email per day to TestBash attendees in the week leading up to the event. These included the schedules for the workshops and conference, details of associated MeetUp events, invites to a slack channel, social media hashtags, information for a book swap, and a set of behavioural requests. These emails created a sense of hype and expectation. They got everyone on the same page about the logistics of the event. They allowed people to start interacting online prior to the event itself, if they wished to do so. I ask the old timers to reach out to those that look lost. I ask for everyone to be brave and speak to anyone who looks like they could do with some company. I ask you all to be human, kind, and helpful. I ask you all to focus on making friends and having a good time. I ask you all to create some incredible memories to remember, for yourselves and everyone else who attends. I ask you all to speak to speakers. I can assure you they want to speak to you too. This clearly set expectations for behaviour prior to the event. 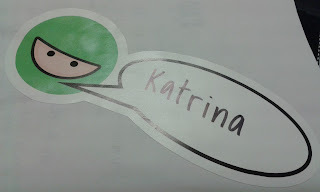 The first task after registration on conference day was to create your own name tag using very large Ministry of Testing speech bubbles and a permanent marker. The name tags were handwritten. You could choose how to present yourself to others at the conference. First name only, full name or nickname. With or without social media details. The name tags were large and colourful, which made them easy to locate on a person and easy to read. Though they clearly incorporated the Ministry of Testing brand, they didn't feel corporate. The variety of handwriting on display made something that is normally staid into something that felt informal and fun. The name tags put a little piece of each personality on display. As the host of the day, Vernon Richards did a great job at specifically reminding people to interact with those who they didn't know. He reiterated the TestBash ethos from the pre-event emails that "No Tester Stands Alone". This expectation was set at the start in his opening remarks and we were prompted of it prior to each break. 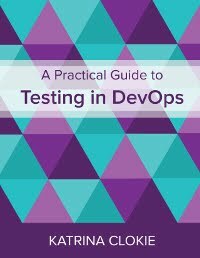 Many of the people that I met were attending as the only tester from their company, yet I rarely encountered anyone by themselves. Vernon demonstrated that you don't have to be afraid to remind people to be friendly. I had never been to a single track conference before. I was really amazed by how different it felt to be part of a large group of people who were all experiencing the same set of speakers. Having over 200 people in one place, focusing on one thing, for an entire day, creates a vibe in itself. I also found that it changed the type of conversations I had in the breaks. Often at conferences the exchanges over tea and coffee are about what each person listened to during the last session. You'll hear snippets and impressions without really understanding what the other presentation was about. At TestBash we had all heard the same topics, so we had deeper conversations about the ideas, what could work in our own organisations, the doubts that we had, etc. A set of shared experiences can offer opportunity to explore further together. There was a Pre-TestBash evening social and a Post-TestBash evening social. There was a Pre-TestBash run and a Post-TestBash brunch. All of these events were publicly advertised in the Software Testing Club MeetUp group. Though they were located in a pub, the evening invitations weren't focused on drinking. They instead put emphasis on connecting with other testers. The invitations were open, inclusive, and there was room for everyone, even if it was sometimes slightly crowded! By keeping those who wanted to socialise in one place, no one felt any fear of missing out. People were really present at these events instead of occupying social media in search of what else was happening. There was a huge amount of support for people to connect outside of the event itself. I'm hoping that these five ideas will help bring a little bit of the TestBash magic to my next testing event, and perhaps yours too? Thank you so much for putting this into words. I've been going around just saying it was excellent and not able to describe why other than it felt like being somewhere with family. Thanks for the words Katrina, appreciated! I think what also helps, which is not mentioned, is the overall work we do to try to bring the community together all year round. I think the simplest way is to say that we do our best to put testers and attendees first. Increasingly people are seeing and feeling this which I believe is a large contribution to the overall experience. Didn't go to this conference but. I have found single track is great as that not missing out is great. Also depending on scale and scope can also help with keeping presenter quality high. (have seen instances where it sometimes ends up accept a talk to keep slots full). Also if the social events are not at the venue provide clear directions and/or people/groups to guide the way. Be that maps and I have also seen a video posted of the route from one location to the next. This particular helpful for out of town people (particularly handy when down laneways etc where Google Street doesn't go). Or google maps is showing an old name for a bar or isn't well named on the outside. Something else I have seen is audio and screens in the reg area (and other areas) as allows people (often volunteers) on the reg/merch desk to still listen/watch in on what is happening. Also for people having conversations outside room can still keep tabs on what is happening.